The stunning views from our condo caught our attention the moment we walked in the door. We often see dolphins playing and parasailers floating by as we relax in the family room or on the balcony. 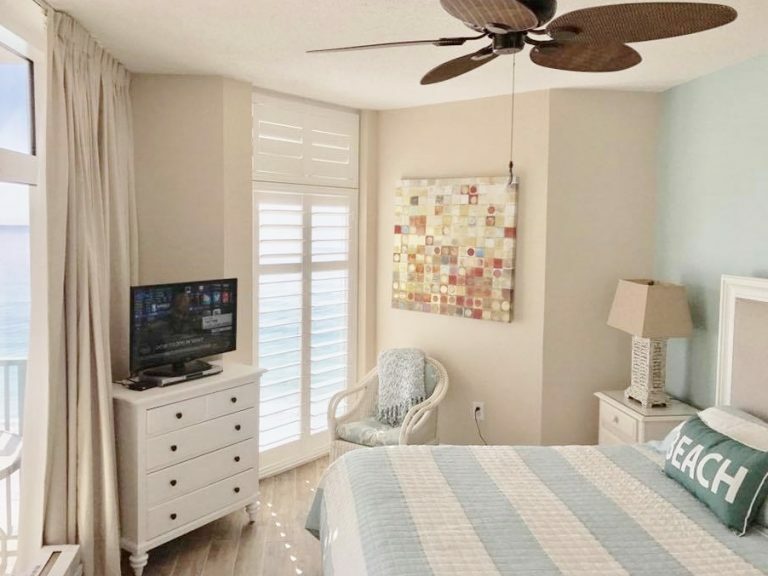 The Coastal Chic decor is perfect for our beach get-away. 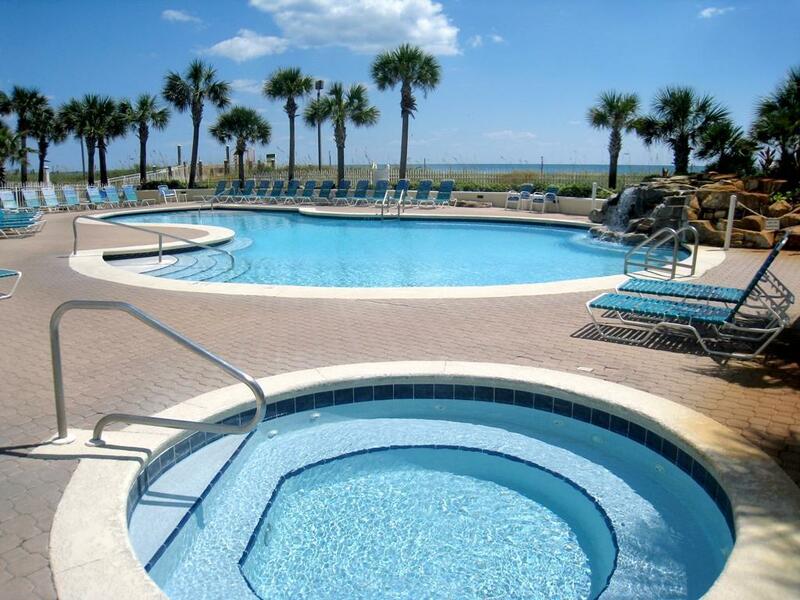 The refreshing ocean-side pool and spa are another perk of our complex. 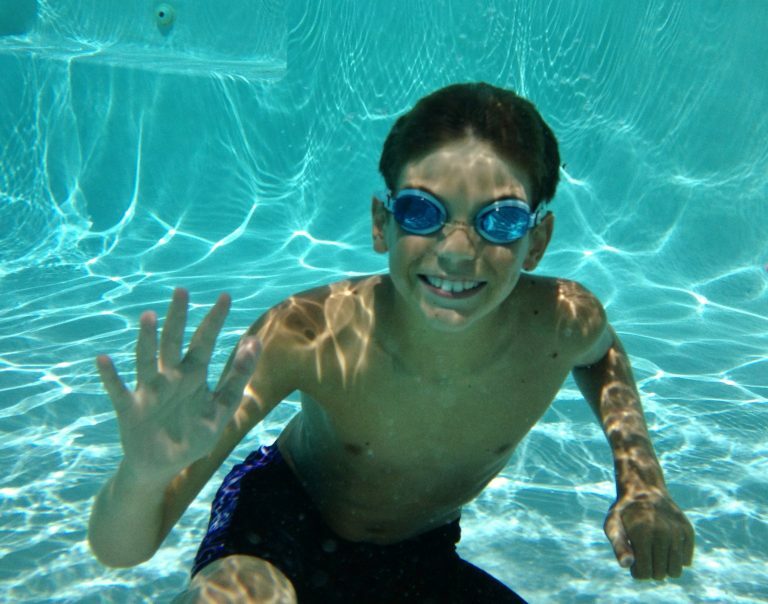 The pool is heated seasonally, and you will find restrooms in the pool area for your convenience. Welcome to Oceanfront Paradise at SandnSol! Our 3 Bedroom, 3 Bath corner unit is on the east end of the building. 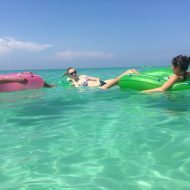 It features a wall of windows with breath-taking views of Destin’s sugar-white sand beaches and emerald green waters spanning all the way to Panama City. Major renovations in late 2016 featuring wall to wall tile and updated bathrooms. Our condo is oceanfront, directly on the beach, meaning you are just steps away from the sugary white sand! Beach service available on-site March-October. Lose yourself in the amazing ocean views and soft sounds of the waves from our balcony or by the Gulf-front pool. The new Coastal Chic décor is stylish and comfortable. Whether you’re watching the sunrise on the balcony, dipping your toes in the refreshing pool, or swimming in the emerald green waters, SandnSol is your own little slice of heaven. Book Now to experience Penthouse Luxury on the eighth floor. Updates include new tile throughout, new showers in all baths, new beds and mattresses, new washer and dryer, plantation shutters, drapes, new furniture, and new decor. 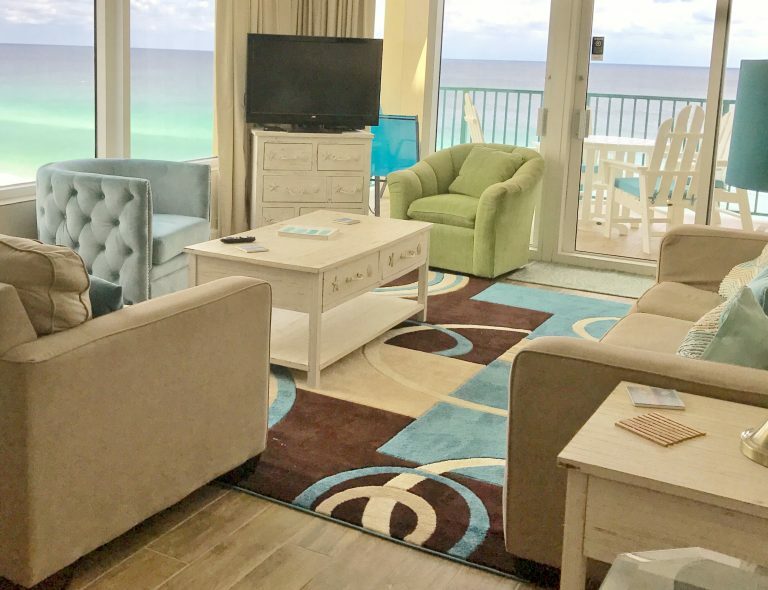 The King master suite and living room (with queen sofa sleeper) have floor-to-ceiling windows and sliding glass doors, which put you right on the beach. The Second bedroom is also a King suite, and the Third bedroom has a Queen bed plus a twin over full bunk. Free Wi-fi. TV/DVD in living room; TV/DVD or VCR in all bedrooms. Book Direct and save on fees! This comfortable family room has eastern and southern ocean views. The sunrises are stunning, and no two are the same. It’s open to the dining room and kitchen, so conversation flows between all spaces. All of the bedrooms feature new beds. Both masters have king size memory foam mattresses, and all bedrooms have shutters and blackout curtains. Just what you need for a great night’s sleep. 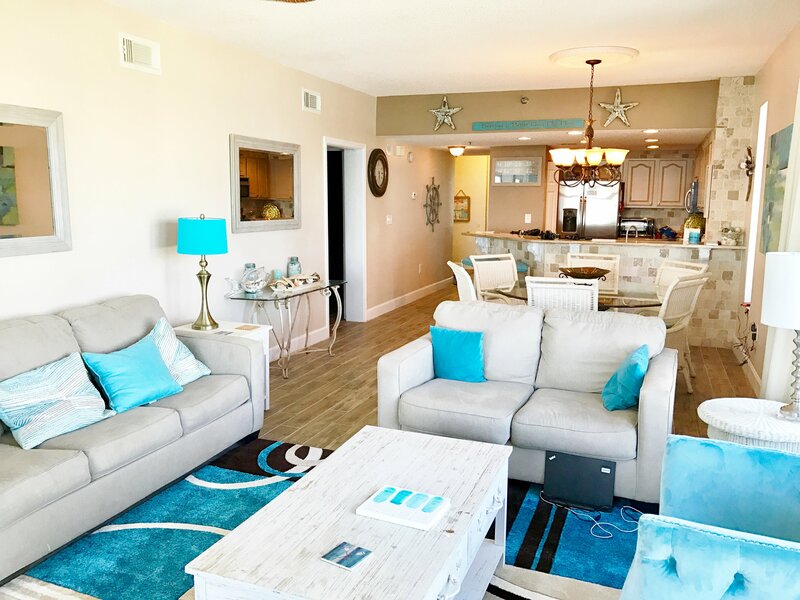 SandnSol is located in Jade East, a luxury, direct Gulf-Front, condominium complex which is centrally located in the heart of Destin. Within walking distance on the road side are restaurants, shopping, groceries and entertainment. 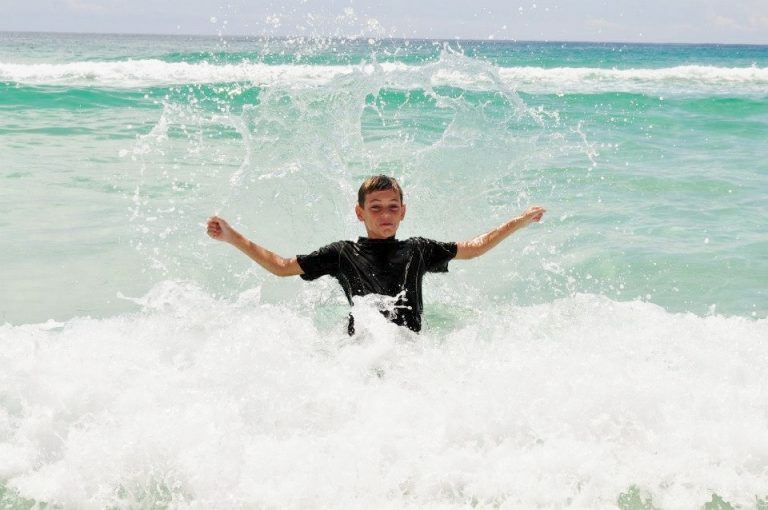 Some of our favorites include Shakes Frozen Custard, Mimmo’s Italian, Dunkin’ Donuts, Chick-Fil-A, several breakfast options, and Big Kahuna water park, The property is gated at both the front entry and the beach access for your privacy and added security. There are no streets to cross, simply go out the back door and cross over the dunes! 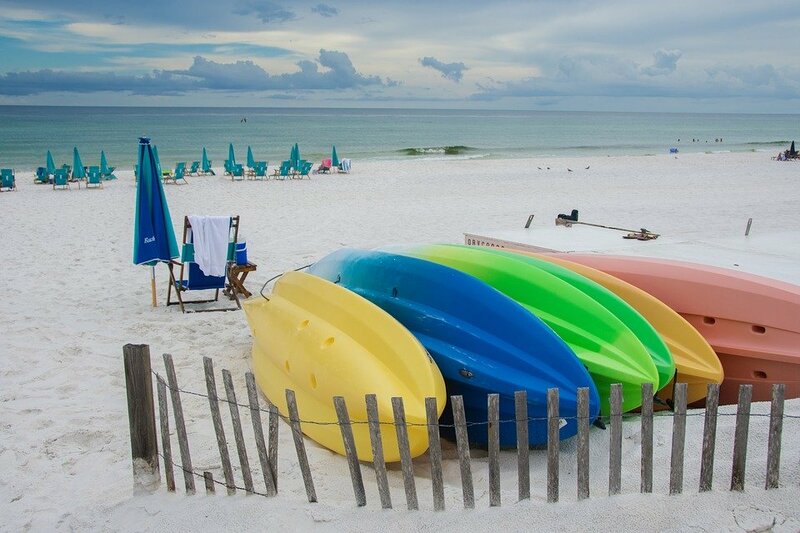 Once on the beach, you will find beach chair service, paddle boards, kayaks and snow cones all available for an additional cost from March through October. There’s ample room to fly a kite, throw a frisbee, build sandcastles, play corn hole or even play volleyball with your friends and family. Feel free to set up your own chairs behind the beach service chairs. We are a pet-free, smoke-free complex.